Comments : We had the pleasure of viewing your five day old litter of Jedda and are happy to have placed a deposit on one. We loved your farm and the freedom and love that your hounds are shown. Cant wait for our girl to come home. Comments : Vicki & Dean Thank you both for information over the past few days. 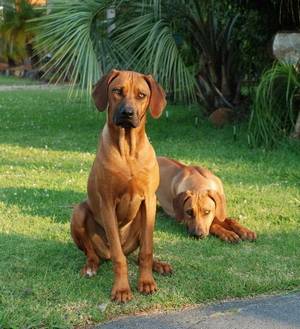 We absolutely have our hearts set on adding a Ridgeback to our family. Fingers crossed! Comments : I just stopped by to see the updates from CR. Our second RR came from your family to ours just over 3 years ago. Dolly (or Miss Dolly as she commonly gets) is a beautifully natured girl who manages to con most people she meets for a pat or cuddle. Thank you for breeding a dog with a wonderful temperament who has a heart as big as she is (and she is a big girl). We love her to death and can't imagine life without her (or our other RR, Dusty). Comments : We picked up our boy Leroy from you last year and he has become an important part of the family. He is now 12 months old and grown into quite a big boy, with the most lovely gentle nature, although he is still a puppy at heart and sometimes forgets how big he is. Thanks for the call on that day when you offered us the chance to bring Leroy into our family. Comments : I have a wonderful (mad) RR who is 8 months old. Soon I'll have to think of getting him a pet of his own, so am beginning the search of breeders close to where I live. A friend has a Cedarrose pup, who plays with my own. I'll be keeping an eye on litter notices. Comments : Hey you mob,can't thank you enough my beautiful Missy.She has all the Ridgebacks traits...loyal protective,inquisitive and soooo loving. She is the light of my life.Happy 2nd birthday to your Sissy and the rest.love Lynne. Comments : Beautiful looking Ridgebacks. WE have lost our boy 3.5 years old died suddenly from hip myelopathy - stunning dog but seems always had health problems from day one! 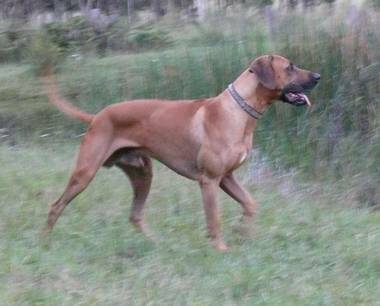 He was our 2nd ridgeback and we just love the breed. We are on 10 acres and the dogs have always been inside with us (beside bed at night) and very well loved. The question is do you ever send your pups to N.Z.